Jim Geraghty of National Review and Greg Corombos of Radio America are pleasantly surprised to hear liberal Joy Behar admit on “The View” that the left launches online outrage mobs because they’re “desperate” to be rid of Trump. They also slam New York lawmakers for legalizing abortion up to the moment of birth and Jim unloads on New York Gov. Andrew Cuomo for lighting the Freedom Tower pink to celebrate passage of the law. And they roll their eyes as freshman Colorado Rep. Joe Neguse wants to pursue the impeachment of Supreme Court Justice Brett Kavanaugh. 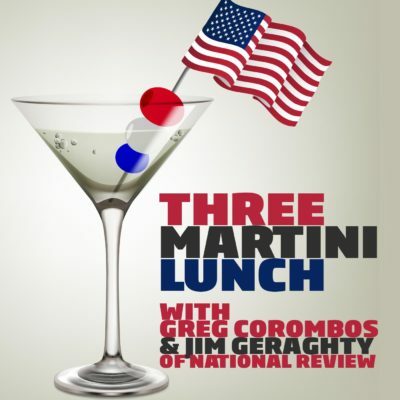 Jim Geraghty of National Review and Greg Corombos of Radio America are thrilled to see Tom Price confirmed as Secretary of Health and Human Services. They also discuss the numerous problems with the Ninth Circuit Court of Appeals ruling on the Trump immigration order. And they slam CNN’s Chris Cuomo for asserting that accusing a journalist of fake news is the equivalent of using the N word. Jim Geraghty of National Review and Greg Corombos of Radio America react to reports that Donald Trump’s son-in-law has engaged in talks about Trump starting a cable news channel. They also slam CNN’s Chris Cuomo for falsely telling viewers it’s a crime for them to read Wikileaks emails for themselves so they need to rely on the media to tell them what’s important. And they groan as a third of U.S. millennials believe George W. Bush killed more people than Joseph Stalin did. Get your inbox under control with SaneBox! Three Martini Lunch listeners get a two week free trial and a $25 credit by going to sanebox.com/martini. Born in TX, grew up in Tulsa, but a "trip home" means I'm headed to Kansas City, now that most of the immediate family is there. I'm an actress in NYC with a day job at the "Deathstar" – - a large law firm that operates 24/7, making it the ideal survival job for creative types. After weeks of fumbling and false promises, President Obama appointed an Ebola Czar. Selecting a public face for the crisis response was designed to calm the public, quiet critics and, most importantly, redirect complex and awkward questions away from the President and his press secretary. Instead of choosing an expert qualified in infectious disease, Obama selected Ron Klain, a longtime political fixer. Klain served as a handler for Vice Presidents Biden and Gore, and parceled out billions of stimulus dollars to politically favored interests.